Junebug pursued a skunk with her usual vigor and head-long enthusiasm, and was rewarded with a face full of spray. Ah!, that familiar smell of burning tires. 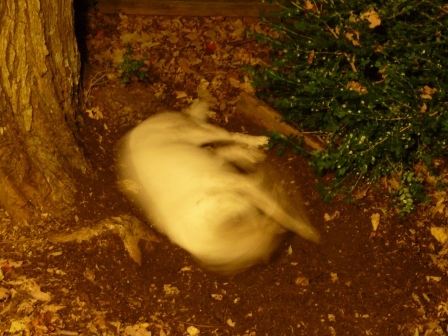 We washed her with peroxide and baking soda but she, not satisfied with the result, ran into the mulch under our maple trees and dug herself a massive wallow in which she thrashed and rolled for quarter of an hour. 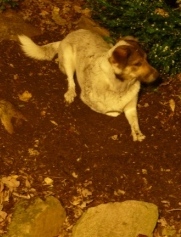 The result: a skunky dog, wet with peroxide tonic, covered in soil. We’ll be branding the resulting fragrance under our new Cudzoo label soon. No doubt this cologne will smell slightly better than some other innovative fragrances. 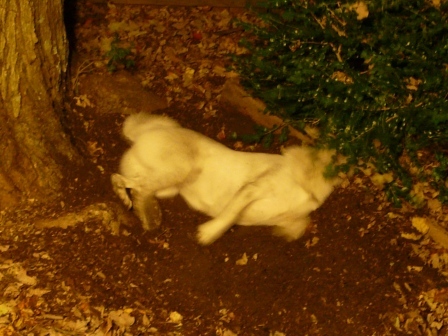 This entry was posted in Junebug the hound on October 1, 2011 by David George Haskell. Poor girl. Poor you two. Yowzer!